Bookphilia.com: Je suis tough! J'aime le perseverence! 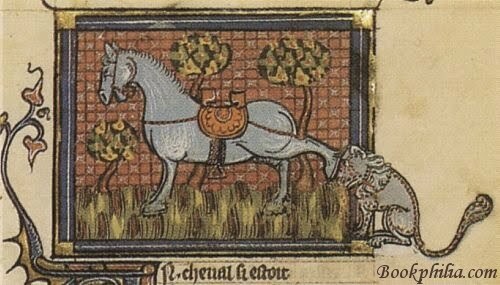 Marguerite de Navarre's Heptameron is a strange beast. Published in 1558 (9 years after the author's death), it presented barely current literary subjects (primarily courtly love) in a by then antiquated form: the framed narrative, known at its representative best via the efforts of Giovanni Boccaccio (1313-1375) and Geoffrey Chaucer (1343-1400). I love me a good framed narrative but sadly, The Heptameron seemed rather derivative to me. It possessed neither the variety of tone and subject matter (never mind gorgeous writing) that defines Chaucer's Canterbury Tales, nor of the intense narrative energy of Boccaccio's Decameron. I found The Heptameron to be hard slogging most of the time, in spite of the occasionally excellent story which appeared gawd knows how, coming from gawd knows whence. But the commentary sets the stage for often quite contentious debates primarily on the differences between the sexes as well as on church corruption. Admittedly, neither of these topics are new to Marguerite and like the structure of the book, were well established at least 200 hundred years before. However, it's the disjoint between the often light and cavalier tone of the tales and the intensity and often anger that infuses the post-story conversations that struck me. Add to this the fact that, as is revealed quite early in the book, the friars from the monastery where the storytellers are stranded every day creep up on them in the meadow and eaves-drop on their tales - and the story-tellers know it - makes for something Very Strange. All of a sudden, this rather dull little book turned into some interesting, at least academically so if not "sheer reading pleasure"-y so. The result is that the commentary after the stories becomes infused with an odd shabby luridness even when the topic is religious faith or something equally staid. To be honest, I'm not sure what to make of this. I do know that if I had to, I could probably come up with a theory, but you know what? I don't feel like it; I didn't really enjoy this book and I don't want to think about it anymore. Back when I was an academic, I found it much easier to engage critically with books I didn't greatly admire but now, in the verdant paradise that is my post-academic life, I want it all - substance and style (see previous post on Romola) and that's what I seem to be responding best to intellectually now. So all I'll say at this point is: don't read The Heptameron unless a) you have to or b) you're engaging on a fool's errand of teaching yourself about French literature. ...You may be detecting some irritation from me re: my French literature project. It's true that I haven't enjoyed the last three books I've read (The Possibility of an Island, La Bete Humaine, and The Heptameron). But I'm not giving up yet. I'm going to persevere in my plan to get a respectable sense of the breadth of French literary history, whether or not you and I like it! But maybe I should really try to rescue this with some Dumas, yes? That's right, it's the frame, the fun is in the frame with this one. My favorite character is Nomerfide, the woman who is an incompetent storyteller - she's responsible for #11, a one page story about the woman who falls into the toilet. Either that or some Colette. Or, hey, Le Petit Prince! Tony: I have no idea what you're talking about! Amateur Reader: She did add a touch of (extremely low) humour - which, sadly, I'd almost completely forgotten about. Sigh. heidenkind: I've read Colette in the past and didn't love it...but I'll try something else of hers one of these days and see if my tastes haven't changed.